Happy New Year from the Bimini Sands Resort! We've got a great holiday schedule lined up for this week including a free family movie by the pool, snorkeling trips, fantastic food and drink specials, and the best fireworks show on Bimini! It all starts Wednesday night at the Bimini Beach Club on South Bimini. The Beach Club is offering a terrific dinner special, as well as tons of fun for the whole family to enjoy. We'll have Live Entertainment all night, a bonfire on the beach, champagne & beer specials, party favors, and of course, the amazing fireworks show. Thursday night we'll be showing a free family movie poolside on our 12 ft movie screen, don't miss it! And Saturday, we'll be heading out on the water for one of our exciting snorkeling excursions! To get a taste of what to expect on New Year's Eve, check out the video below to see our 4th of July fireworks display... And have a great 2009! 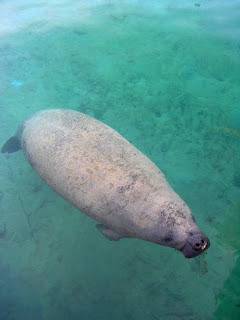 For over a week now, a large manatee has been seen slowly patrolling the shallow waters around Bimini. First sighted near Radio Beach on North Bimini, the manatee has been making regular swims up into the Alice Town harbour, hanging out under the docks and creating quite a sight for both locals and visitors. While manatees are not found in large populations in the Bahamas, there are some islands that report regular sightings of these gentle marine mammals. By most people's accounts, the last time a manatee was seen in Bimini was over a decade ago. A team of workers from the Miami Seaquarium is already on site, trying to assess the health of the manatee and determine if it should be relocated to Florida. So far, the manatee looks healthy and is behaving fine. 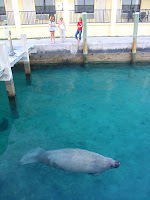 For more information on manatees, click here. We are honored to announce that the Bimini Sands has been named as a finalist in this years 13th annual Cacique Awards. The Cacique Awards are presented by the Ministry of Tourism each year to recognize those who "are exemplary in their field of work as it relates to tourism." This year, the Bimini Sands Recreation & Activity Center has been named one of the top finalists in the "Sustainable Tourism" category for their work developing the Bimini Nature Trail and other eco-tourism opportunities around Bimini. For more information on this years Cacique Awards finalists, click here. The award ceremony will take place on January 30, 2009, so check back soon to the Bimini Sands Blog for more information on this exciting news!! !